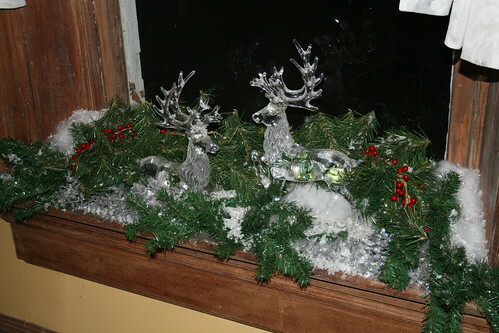 When my DDIL helped decorate a few Saturdays ago, she put together one of the dining room window sill displays. 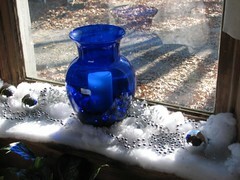 I wanted to do something different than the blue vases I used last year. I love those, but am trying to take the cobalt blue out of the room. This is what they looked like last year. This entry was written by ~~Rhonda, posted on November 20, 2009 at 2:06 pm, filed under Christmas, Christmas prep and tagged Christmas, dining room. Bookmark the permalink. Follow any comments here with the RSS feed for this post. Post a comment or leave a trackback: Trackback URL. What about a small pine tree? So it looks like the deer are laying under it? 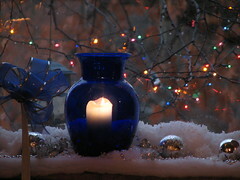 Maybe you could find some small lights that look like candles to put on it. You know…like the way people used to put real candles on the trees with those clips? That’s a good idea, Kathy. I’ll have to see what I can do…the only trees I have right now that would work are the ones I use with my “Tale of Three Trees” book display. How about stacking some books under the deer to raise them up out of the greenery. Two or three small trees (taller than the height of the raised deer) one tree on one side, two on the other side of the deer. Dollar Store trees may be trimed with a wire cutter so they have the size and shape you like. Sprinkle some loose plastic snow overall. Also, you may add some mini pinecones randomly through the greenery and snow. Tip the ends in white paint and the white glitter. The glitter from the Putz houses would look beautiful.